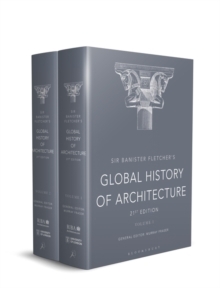 Sir Banister Fletcher's Global History of Architecture is the acknowledged classic reference work for architectural history. It has been essential reading for generations of architects and students since the first edition was published in 1896 - and this tradition continues today as the new 21st edition provides the most up-to-date, authoritative and detailed account of the global history of architecture available in any form. Thousands of major buildings from around the world are described and explained, accompanied by over 2,200 photographs, plans, and drawings. Architectural styles and traditions are placed within a clear framework, and the chronological and geographical arrangement of the work's 102 chapters allows for easy comparative analysis of cultural contexts, resources, and technologies. Published for the first time in full colour, and entirely rewritten throughout by over 100 leading international architectural historians, this is a landmark new edition of a classic work - one which reflects the very latest scholarship and brings a thoroughly contemporary understanding to over 5,500 years of global architectural history.